Get District and Session Court Karak Jobs 2019 Application Form Download | nts.org.pk at this page of our site. District and Session Court Karak is a reputed Justice Institute which is responsible for hearing the civil and criminal cases for Karak district of KPK. Sessions Court Karak is looking for educated and skilled candidates for the vacant posts given below. 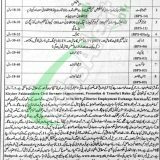 Jobs in Session Court Karak (Computer Operator (BPS-16), Stenotypist (BPS-14), Junior Clerk (BPS-11), Process Server (BPS-05), Driver (BPS-06), Chowkidar (BPS-03), Sweeper (BPS-03), Naib Qasid (BPS-03)). Both Male and female candidates are eligible to apply for the above-mentioned contract basis positions and duration of the contract is extendable on satisfactory performance of an individual. Candidates willing to apply should hold relevant educational abilities as per the criteria mentioned in the following image such as Bachelors to Matric/Middle qualification with relevant experience is required to apply and Age of a candidate should be between 18 to 40 years. So, only interested candidates meeting criteria should apply as per the following how to apply procedure given below because it is the finest opportunity for female candidates to have a Government job and after final selection, handsome salary package will be offered to the selected female computer operator. For Sr., No. 1 to 4 Applicants should apply by downloading the form along with a deposit slip from the NTS Site www.nts.org.pk or from www.jobsalert.pk. The test can fee shall be paid in any branch of ABL / MCB / Meezan / HBL on the prescribed bank Challan. Application forms for Sr. No. 5 to 8 can be obtained from Budget and Accounts office located at District Court Karak should reach the Office of District and Session Judge Karak. The last date for submission of application is April 12, 2019. For more information about the candidate list and test result, please visit our site JobsAlert. pk. Last Date to Apply: April 12, 2019. Address to Apply for Sr. No. 1 to 4: NTS Plot # 96, Street # 4, H-8/1, Islamabad. Address to Apply for Sr. No. 5 to 8: Office of District and Session Judge Karak.